Potters Bar garage of Metroline has to send its buses far and wide to justify its existence, as there is little by way of bus work in Potters Bar itself, just outside the London border in Hertfordshire. Indeed the garage’s buses make it into the heart of central London, on route 82 to Victoria, itself quite a long route by present day standards. One catch is that if a bus breaks down in Victoria it can take quite a long time to get the rescue crew out! 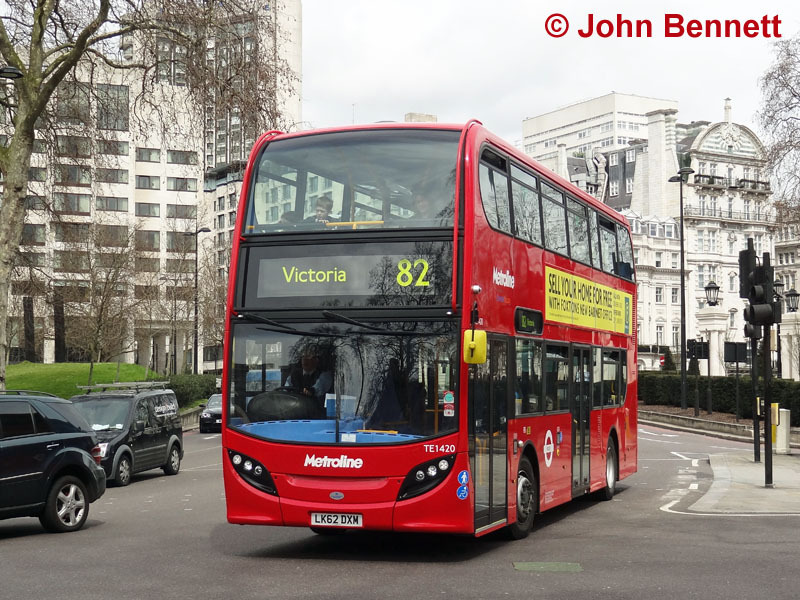 However, instances of breakdowns shouldn’t be too common on the 82, now that the route has a brand new fleet of Enviro400 low floor double deckers. As is often the case these days, I have a selection to offer. Firstly TE1424(LK62 DXX) at Temple Fortune, near Golders Green, on 16 March 2013. Next, TE1420 (LK62 DXM) rounds Hyde Park Corner near the end of its journey on Monday 15 April 2013. The light loadings are fairly typical for routes in central London outside peak hours. Finally TE1431 (LK62 DYH) was captured in Victoria itself, where major works have been proceeding for some time to enlarge the Underground station so that it can cope with the ever increasing numbers of passengers being disgorged from National Rail services there. 11 April 2013. 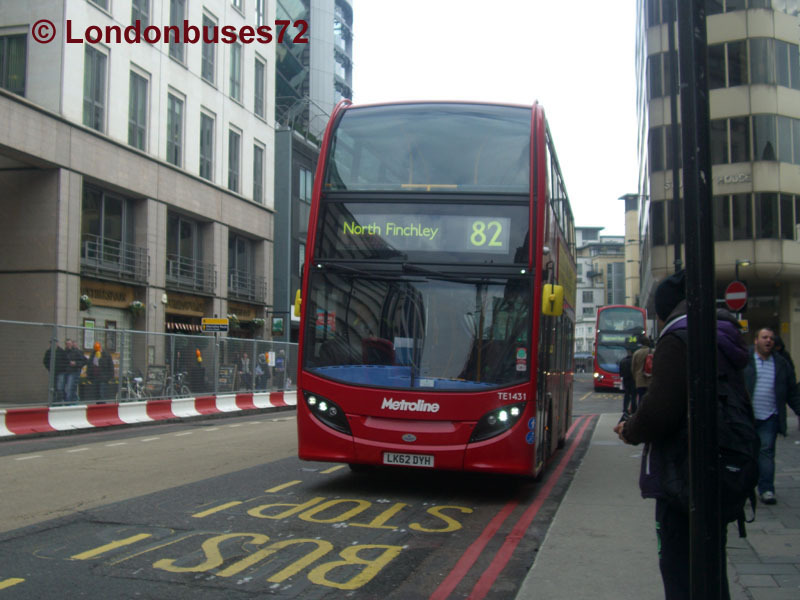 The 82 starts from North Finchley, and it is thought that all buses start and finish their day’s work there, rather than any buses having to run empty all the way from Potters Bar to Victoria. The section between North Finchley and Golders Green was introduced in 1991 in replacement for the trunk part of route 26 (the other parts becoming route 326). Prior to that the 82 had run through to Barnet on Sundays only, when the 26 did not run. 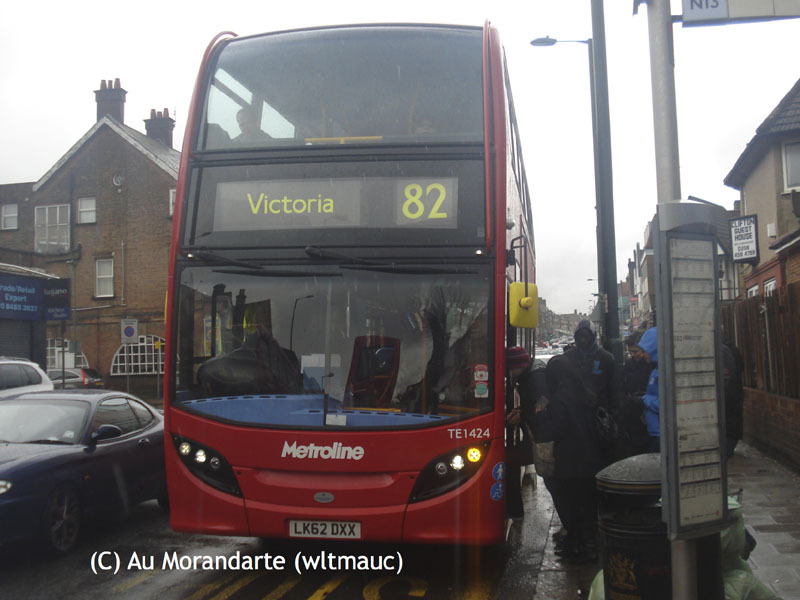 Ironically, the 82’s predecessor, route 2, used to run to North Finchley (from Crystal Palace).